I know that the name ‘Genesis’ is not exactly the biggest name in the world of electric scooters, but bear with me here. This is because the Genesis Hornet electric scooter is going to be far better than most electric scooters on the market. For starters, let’s have a look at the facts before we go more into detail of what this electric scooter has to offer. Genesis Hornet is a great ride for people who value speed, portability and affordability. It features a stylish look and superb build quality. 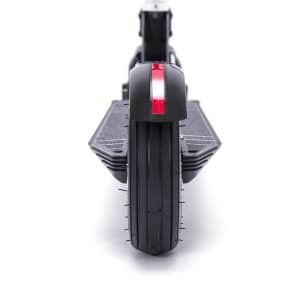 The only real downside is the size of the wheels that make the scooter perform lousy on bumpy roads, therefore it is recommended to people who tend more on smooth terrain e.g. college students. It is unlikely that the Genesis Hornet is going to be winning many awards when it comes to design. However, there is no denying that it looks pretty stylish. The problem I see with many electric scooters nowadays is that they always tend to try and stand out from the crowd. They go overboard with how they look. Tons of added bulk, which really detracts from the fact that it is nothing more than a scooter, albeit one with a little motor which will keep it chugging along. That isn’t going to be a problem with the Genesis Hornet Electric scooter. It looks just like your normal scooter. Of course, there is a small amount of bulk at the front to accommodate the fact that the motor is stored there, but even then it isn’t really that noticeable. 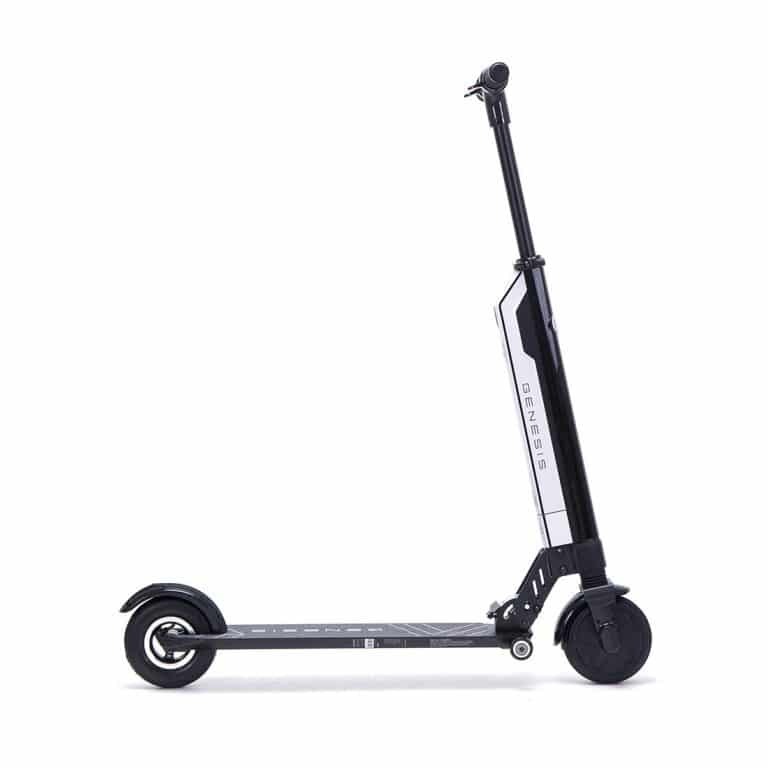 If you want a scooter that doesn’t scream “hey, I spent hundreds and hundreds of dollars buying something electric”, then this is no doubt going to be up your alley. The one issue I do have is the fact that it may be a bit too similar to your standard scooter. This is all in the wheels, although that is something that I am going to talk about later on. You should be able to hit 16 miles per hour on the Genesis Hornet scooter, with a range of around 10 miles. It is not the fastest electric scooter on the market, but as long as your commute is not too long you should be able to get to wherever you want in a timely manner. You do not have full control over the speed, though. There are just three settings on the scooter; slow, medium and fast. For most people this should be more than enough. However, with the majority of electric scooters on the market nowadays starting to have fully adjustable speed control it would have been nice if this scooter had brought something ‘different’ to the table, but alas that was not the case. While the range on this scooter certainly is not too shabby, you will be pleased to know that it is able to be charged in double quick time. In fact, it will take just 2 hours to get the battery in Genesis Hornet from zero to fully-charged. This means that it is absolutely the perfect commuter scooter. Just ride it into work, throw it on charge, and you will have something to get you back home properly at the end of the day. How nifty is that? One of the things that I, personally, love about the Genesis Hornet is the fact that it is so portable. Now, unless you are travelling a whopping great distance on the scooter, chances are that the battery is not going to go flat on you randomly. It may do, but that will be near the end of the battery’s lifespan (batteries do get old, sadly). However, if the battery does go dead on you, the Genesis Hornet can be used just like a normal, albeit slightly expensive push scooter. In fact, I know of plenty of people who are using this as a way to get exercise daily, and then just turning it on when they feel if they are getting a little bit lazy, so that they can start whipping about using the electric functionality. Many of the other electric scooters on the market do not tend to function well as push scooters when the battery is flat. They are just too bulky and you are probably going to get incredibly tired pushing it along the floor. So, if you fancy a hybrid scooter of some sort, then this may be right up your street. Of course, the portability will benefit you in other ways. Many of us are not just riding to and from work. We may need to hop on public transport along the way. Luckily for you, this is the type of scooter that you can easily fold up and slide under your arm. The main issue I have with the Genesis Hornet Electric Scooter is the wheels. They are just too tiny. Now, I understand the reasoning behind this. Genesis did want to make a scooter that is a hybrid of electric and push, and I think they have done a good job. The problem is that this means it is never going to be anything more than a scooter for commuting to and from work. It is only really going to work if the areas that you are travelling over are not too bumpy. Basically, if your taxes have not been used to ensure that the roads and sidewalks are in tip-top condition, then this scooter is probably not going to help you. It doesn’t really deal with bumps all that well. In fact, it is pretty terrible there. 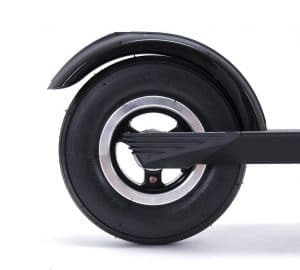 However, the wheels ensure that as long as you are on a smooth area, then you are going to feel pretty decent riding this scooter. That being said, this scooter is able to support a whopping amount of weight. It can support people well over 220lbs which is surprising, considering the wheels are so small. I think that this is more a testament to the build quality of the scooter as opposed to anything else, but more on that in a short while! This scooter handles like an absolute dream. Now, if you have ridden a push scooter before, then you are going to feel very much at home when riding the Genesis Hornet Scooter. Although, in my experience, this scooter is going to be a lot more responsive than your typical push scooter. It needs to be. Imagine blissfully travelling at 10 miles per hour on this scooter. Unless you are in a cycle lane (which you should really be if you are riding an electric scooter) then you are going to be weaving in and out of people almost constantly. You want something that is going to be responsive so you don’t need to slow down. 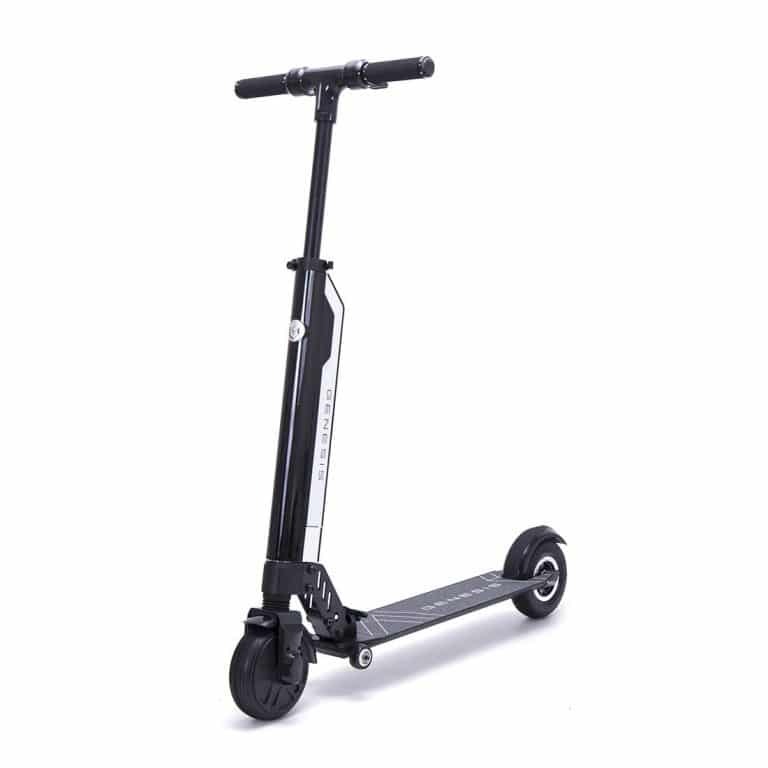 With this scooter, it will react basically instantly to your movements and there is no ‘stiffness’ in the handlebars, a common issue with some of the cheaper electric scooters on the market. It just feels fantastic to ride. The brakes are brilliant too. Of course, you have some brakes built into the handlebars, but if you are going to be riding this like a traditional push scooter, then it is going to be easy to hit the back brake. Again, this is going to be one of the more responsive scooters on the market here, which does help to make it a little bit safer to ride. There is a surprising amount of power built into the motor too. You are going to be able to climb up small inclines with ease. You aren’t really going to be traversing really steep hills, but I don’t think a single electric scooter on the market has really been built for that. The amount of power in the motor means that you are not going to be hopping on and off almost constantly to travel about…which is always nice! To hit full speed, you will need to give the scooter a kick start when you start riding it, but that is pretty standard anyway. The build quality of this scooter is absolutely superb. In fact, I think there is very little which can actually go wrong with it. It is quite a simplistic scooter, and while others on the market tend to have these weird and whacky gadgets in every which direction, the Genesis Hornet Scooter keeps things nice and simple. It is nothing more than a motor attached to some wheels. No suspension (a small issue), which could go wrong. Nothing. This means that if the scooter does end up failing, albeit how unlikely that is, you will easily be able to replace the parts on it. I reckon that, if treated properly, this scooter is going to last years. The wheels are often a ‘failing’ point on many scooters, because they do tend to wear down quite quickly. Not going to be a problem with the Genesis. Sure, they are probably going to wear down eventually as all urethane wheels will do so, but after riding this for a good couple of hundred miles, you won’t even be able to tell. This scooter is just going to last an incredible amount of time. See. Here is the kicker. Genesis have recently gone out of business. You may think that this is a bad thing and that you are not going to be able to obtain customer support from them. Only the latter part is true. Well, it is bad that Genesis went out of business, but that is a story for another day. The thing is that Genesis were so well-regarded during the time that they were in business, you are going to be able to get spares for their gear for many, many years to come. This is not a company that has produced some weird and whacky battery that you are only going to be able to get through them. So, even though Genesis no longer exists, you should have no trouble getting your hands on the parts you need to ensure that your scooter remains in prime condition for a long time to come. The community around Genesis also means that there is a ton of fantastic guides out there for ensuring that the scooter you have can easily be repaired within the comfort of your own home. Although, let’s be honest, there is probably little that is going to go wrong with your scooter anyway, so don’t fret about it. So, in summary; while Genesis no longer exist as a company, you are going to be in safe hands should you buy one of their scooters. Unlike other companies that have gone out of business, you are not just going to suddenly be left in the lurch because your scooter is broken. Don’t worry. Who is the Genesis Hornet scooter for? The Genesis Hornet Scooter is for just about everybody who wants a pleasant commute to and from work without spending a lot of money. However, it is not necessarily going to be ideal for every situation i.e. the wheels are not going to allow you to travel over the bumpiest of terrain. If your commute into work is nice and simple, or you need to hop onto public transport quite regularly, then I think that this scooter is going to be perfect for you to use. It is affordable. It goes pretty fast, and it is nice and portable. You can’t really go wrong. One area which seems to give a lot of praise for the Genesis Hornet Electric Scooter seems to be college campuses. This is because the areas tend to be pretty smooth (they have to put those high tuition fees to use, right? ), and you want something nice and small to pack up for when you get into class. This scooter is likely going to be perfect for you. So college students may want to check it out. This may be just what you need to ensure that you get to your next class on time! I absolutely do recommend this scooter. It functions well. It does have the downside that Genesis are no longer functioning as a company, but this means that the scooters on the market are going to be even cheaper than they were in the past. I can’t see anybody being disappointed with one of these.